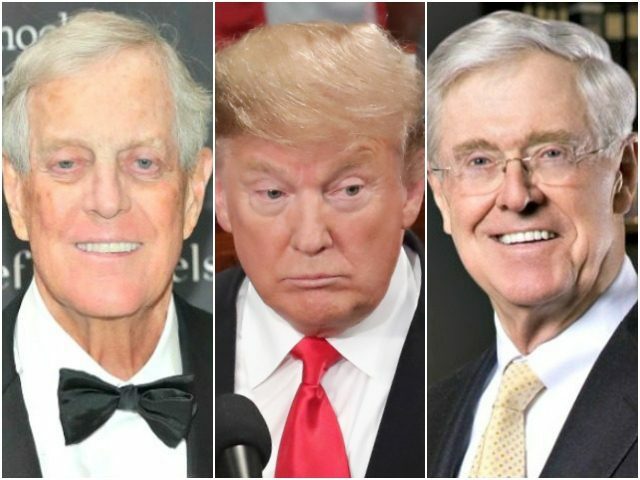 The pro-mass immigration Koch brothers’ network of billionaire, donor class organizations is cheering President Trump’s recent doubling down on supporting increasing wage-crushing legal immigration levels. As Breitbart News reported, Trump broke from his 2015, 2016, and 2017 “America First” commitment to reduce overall legal immigration levels to raise the wages of America’s working and middle class this week when he doubled down on a call for increasing legal immigration. “We need people in our country because our unemployment numbers are so low and we have massive numbers of companies coming back into our country,” Trump reportedly told the media this week. Now, the pro-mass immigration and economic libertarian Koch network is praising Trump’s statements endorsing more legal immigration beyond the already 1.2 million legal immigrants that are admitted to the country every year, depressing the wages and job prospects of American workers. The Kochs and their network of donors have opposed any reductions to legal immigration to raise American workers’ wages; reforms to save U.S. taxpayers billions by ending welfare-dependent legal immigration; and an end to the country’s birthright citizenship policy that rewards illegal aliens’ U.S.-born children with American citizenship. The Washington, DC-imposed mass legal immigration policy is a boon to corporate executives, Wall Street, big business, and multinational conglomerates, as America’s working and middle class have their wealth redistributed to the country’s top earners through wage stagnation.